The Grenoble C8 HMS is a super comfort touring ebike sporting the very latest, new almost silent Shimano E6100 motor. 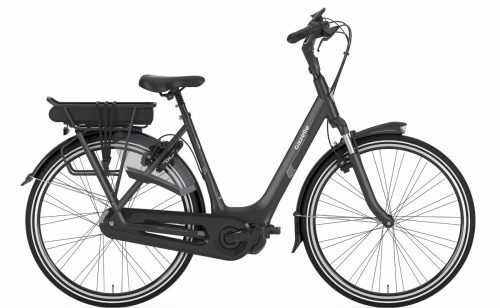 The range of Grenoble C8 ebikes from Gazelle are some of the most comfortable. In addition, they’re beautifully built and extremely elegant. It goes without saying that the Grenoble C8 HMS is no exception. Packed with features unique to Royal Dutch Gazelle, the C8 HMS provides the ultimate in luxury and riding comfort. Equipped with a large 500Wh battery, this delightful creature provides huge range. Ever since 1892, Gazelle has been manufacturing the finest quality bikes that give the easiest and most comfortable ride possible. They have achieved immense recognition throughout the years. As a result, they are well known for their attention to detail. Gazelle’s ebikes are smooth to ride, cleverly designed and robust in quality. Featuring Shimano’s brand new 60Nm E6100 STEPS Drive, the Grenoble C8 HMS glides smoothly, effortlessly and extremely quietly through any terrain. Equipped with a silky smooth and hassle free Nexus-8 speed hub incorporating Shift Sensor technology, the Gazelle Grenoble C8 HMS allows the rider to change gear smoothly while pedaling; not a feature on many other hub geared bikes! The centre-mounted crank motor delivers a well-balanced and quiet mode of operation through three power assistance levels. Furthermore, each power level is easy to change via a simple control unit on the handlebar. Strong, innovative AXA lighting integrated into the front mudguard provides hugely pleasing aesthetics. As a consequence, the lamp illuminates the road ahead admirably, satisfying the most stringent quality and safety standards. Royal Dutch Gazelle’s integrated lighting has won design awards for such innovation. Like all models in Gazelle’s range the Grenoble C8 HMS comes with a 10-year warranty on the frame for on-going, worry-free cycling. In addition, there is 5 years on suspension front forks and 2 years on other components including motor and battery. The paint on a Gazelle is indestructible, as well as being rock-hard and scratch-resistant in every colour. The durability of a Gazelle is second to none and has very low maintenance costs. Equipped with ultra responsive Magura HS 11 hydraulic rim brakes, easy to adjust handlebar positions, and suspension seat-post, results in the Gazelle Grenoble C8 HMS providing ultra comfort and safety at all times. Also available in crossbar frames in a variety of sizes.